HMS York after the attack of 26 March 1941. Italian/Greek Campaign: The campaign in Albania has hit a lull on 26 March 1941. Both sides are recuperating from the recent Italian Primavera Offensive. While the attacks accomplished no changes in territory, they did leave a lot of dead bodies, many of which remain to be buried. East African Campaign: With British troops controlling the rim of the Dongolaas Gorge which controls access to Keren, British sappers spend all day clearing the gorge of obstructions placed their by the Italians. By midnight on the 26th, the road is clear and the British start pushing armored vehicles through it. From here on out, the Italian position becomes increasingly untenable. Elsewhere, the Italians at Harrar, Abyssinia surrender to Major Orde Wingate's Nigerian 23rd Infantry Brigade. European Air Operations: On Hitler's orders, the Luftwaffe begins transferring hundreds of planes east to stock General Alois Löhr’s Luftflotte IV airfields in Rumania and Bulgaria. These will be used in upcoming Operation Marita. This will impinge on air operations all across the Axis periphery, including North Africa. Some top fighter squadrons make the trip, including JG 27 and JG 51. Even units left behind have to consolidate their operations to take over some that had been handled by other units previously, so the pace of Luftwaffe operations all across the Western Front slows drastically. The Luftwaffe sends a few scattered raiders over southern and western England during the day, but nothing major after dark. The RAF focuses on shipping off the Dutch coast. 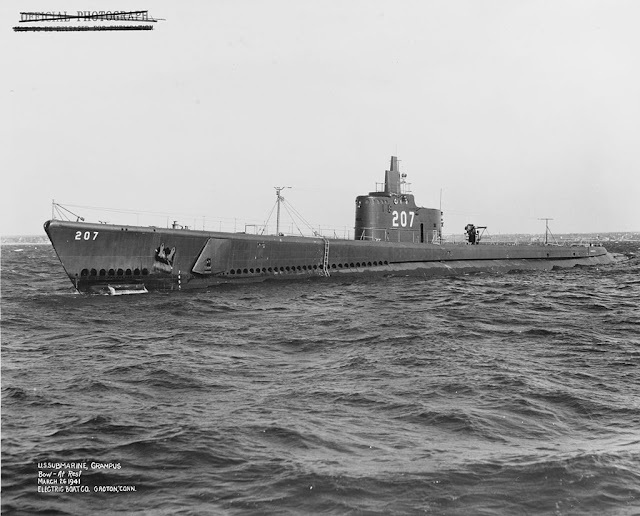 USS Grampus, running trials off Groton, Connecticut, 26 March 1941. The Electric Boat Company of Groton built many of the US Navy's submarines, and they still do, though it is now known as General Dynamics Electric Boat. Photograph from the Bureau of Ships Collection in the U.S. National Archives. The battle of the Atlantic looks lousy, & privately I wish I had more real faith in the navy (emphasis in original). German heavy cruiser Admiral Scheer has managed to slip past the British patrols and convoys as it heads back to Germany. It makes it through the Denmark Strait after dark and heads to Norway. The Luftwaffe bombs and badly damaged 6809 ton British freighter Somali off Blyth. There is one death. Efforts are made to save the ship, but it eventually sinks off Snoop Head, Sutherland. The Luftwaffe bombs 6381 ton British freighter Empire Mermaid in the Northwest Approaches. The ship eventually sinks. There are 22 deaths. The Luftwaffe bombs and damages 1151 ton Norwegian freighter Noll west of Lundy Island. The captain manages to beach the ship before it sinks. It later is refloated and makes it to Swansea. The Luftwaffe bombs and badly damages 3645 ton Finnish freighter Carolina Thorden at the entrance to Tórshavn Bay in the Faroes. The captain beaches the ship, and it is later towed to Kirkwall and thence to the Tyne for repairs. However, it never returns to service and instead eventually will be used as a blockship. There is one death, a passenger. The Luftwaffe bombs and sinks 85 ton Faroes fishing boat Beinisvor east of the Faroes. Everyone survives. The Luftwaffe bombs and damages 331 ton British freighter The Lady Belle south of Grassholm Island (off the southwestern Pembrokeshire coast in Wales). British 503 ton freighter Brier Rose sinks in the Irish Sea, perhaps due to a mine. Canadian armed yacht HMCY Otter catches fire off Halifax Lighthouse. There are 19 deaths, while 4 men are picked up by a passing submarine (HMS Talisman) and 18 others are found alive by Polish freighter Wisla. The Royal Navy's 1st Minelaying Squadron departs from Loch Alsh to lay minefield SN 4. The Luftwaffe spots the force and bombs minelayer HMS Menestheus, requiring it to return to the Clyde for repairs. 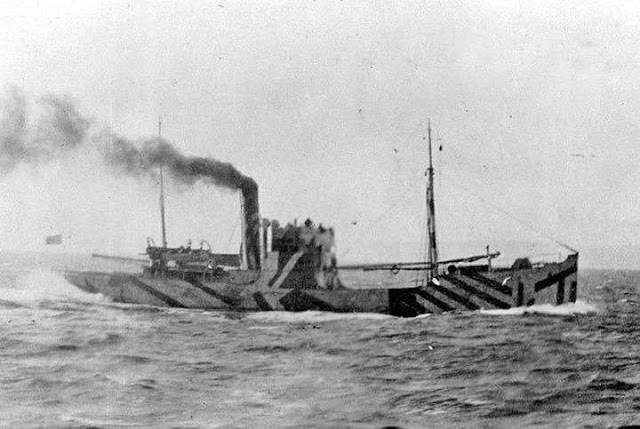 Former luxury yacht HMCY Otter, lost to a fire off Halifax Lighthouse on 26 March 1941. Battle of the Mediterranean: Six Italian one-man explosive speedboats (Barchini esplosivi) were deposited by destroyers Crispi and Sella about 10 miles off the coast of Crete late on the 25th. These are nothing special, basically just tourist speedboats modified to hold torpedoes in the bows, but they are quite effective when handled properly. In the early morning hours, three manage to make their way into the harbor and make attacks. Suda Bay is full of British ships and supposedly is one of the most well-defended spots in the world. The Italian motorboats have no difficulty entering the harbor around 05:00, and the boat pilots head straight for prime targets. After aiming the boats at their targets, the men jump off about 100 yards (meters) away. They seriously damage Royal Navy cruiser HMS York (two dead) and badly damages Norwegian tanker Pericles (it later sinks on its way to Alexandria). The York's captain runs it toward shore, but it actually sinks before he makes it. Fortunately for the British, the water in the bay is very shallow and so the effect is essentially the same. The damage to York is particularly bad because the main damage is to her engine room area. There are simply no facilities or equipment at this bare-bones outpost to undertake the major operation required to restore the ship sufficiently to get it to a dry dock somewhere safe. The Royal Navy makes the best of the situation, stiff upper lip and all that. On the bright side, many of the ship's guns are still usable and can be worked with the assistance of power lines strung from submarine HMS Rover. What cannot be avoided is the ship's vulnerability, stuck in the mud in an exposed position, making it a beacon for aerial attacks. This attack begins a chain of events which leads to its total destruction and abandonment, though that won't happen for a while. The six Italian pilots are picked up by the British in the harbor and made POWs. Vice Admiral Angelo Iachino screws up his courage amidst German pressure to do something with his big ships and takes the Italian fleet in the general direction of Greece. 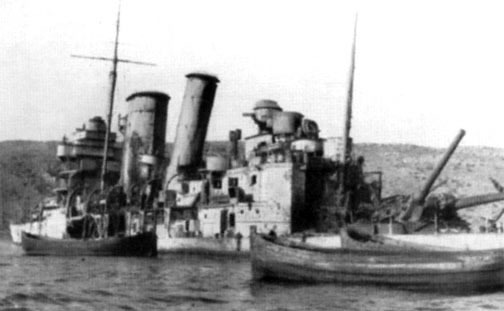 The objective is to attack supposedly vulnerable British convoys from Alexandria and Suda Bay bound for Piraeus. Iachino is aboard battleship Vittorio Veneto, which is protected by heavy cruisers Bolzano, Fiume, Pola, Trento, Trieste and Zara. In addition, there is light cruiser Giuseppe Garibaldi and 17 destroyers of the 9th, 13th and 16th Destroyer Divisions. This is the opening stage of the Battle of Cape Matapan. Royal Navy submarine HMS Rorqual has been busy laying mines along the convoy routes from Palermo to Tripoli, and today they pay dividends. We are naturally concerned at rapid German advances to Agheila. It is their habit to push on whenever they are not resisted. I presume you are only waiting for the tortoise to stick his head out far enough before chopping it off. It seems extremely important to give them an early taste of our quality. Of course, "our quality" in the vicinity has been drastically undercut by Churchill's decision to take out his best troops and sent them on a futile quest in Greece. The message rather clearly conveys Churchill's lingering dislike of Wavell and hints that he is "not resisting" sufficiently - not something that military men like to be told. Wavell knows that he is better off staying in a defensive crouch, though, given all the dotty transfers north to Athens. 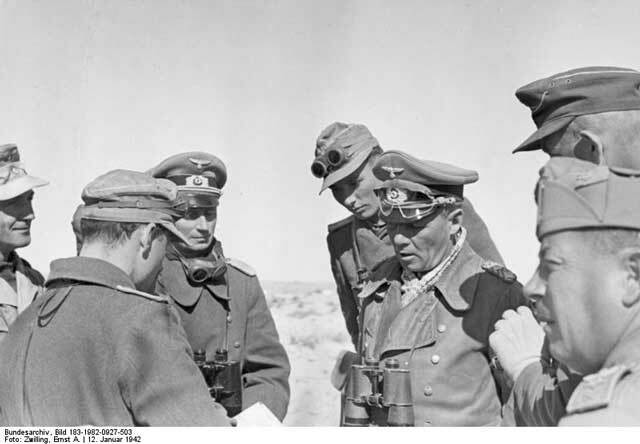 General Rommel, meanwhile, has the initiative, though no orders to advance. The OKH (army high command) notes in a situation report that its intelligence arm has been monitoring British radio traffic, giving a fairly clear picture of British dispositions around Agedabia, Soluch and Magrum. A Junkers Ju 87 Stuka unit is withdrawn to Sicily, making reconnaissance of Free French forces to the south sketchy. Greece is attracting forces from both sides like a magnet. Royal Navy submarine HMS Rorqual, finished laying its mines, torpedoes and sinks Italian freighter Ticino north of Trapani. The Luftwaffe bombs and damages 1006 ton British freighter Adige off Malta. The captain beaches it at Malzara Creek, and it is later repaired. The Luftwaffe bombs and damages 6992 ton British freighter Baluchistan in the eastern Mediterranean. Italian coaster Helena hits a mine and sinks off Palermo. This is one of the mines laid recently by HMS Rorqual. Italian freighter Verde hits a mine and sinks west of Sicily. This mine also was laid by HMS Rorqual. The opening stages of Operation Pedestal take place with departures of oiler HMS Cairndale from Gibraltar. It is a fairly quiet day on Malta, with some Luftwaffe reconnaissance flights but no attacks. This is due at least in part to the transfer of Luftwaffe units east to support the invasion of Greece. Convoy AG 9, with six ships, departs from Alexandria bound for Piraeus. Battle of the Indian Ocean: German raider Pinguin and consort Adjutant are heading north for a rendezvous with German ships in the vicinity of the Seychelles. 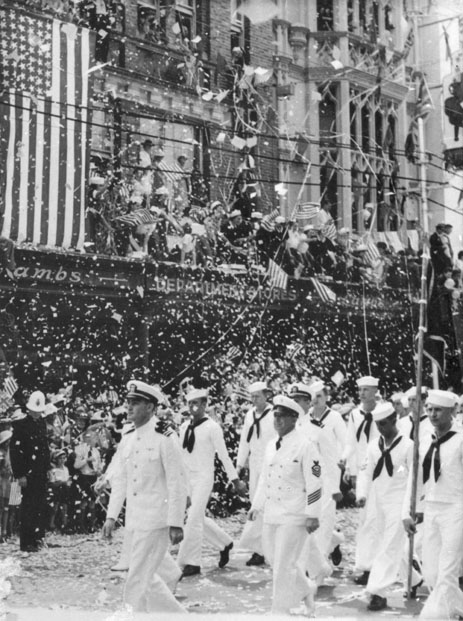 US sailors being fêted in Brisbane, 26 March 1941. Rear Admiral John Newton's visit to Australia is going very well. Queensland State Archives, Digital Image ID 2982. Battle of the Pacific: British 287 ton fishing trawler Millimumul (Captain Rixon) hits a mine and and sinks near Newcastle, New South Wales. There are seven deaths. The mine had been laid months ago by German raider Pinguin. Minelayer Kung Wo lays mines off Singapore. German/ Japanese Relations: Japanese Foreign Minister Yosuke Matsuoka is in Berlin, but he is not getting much done. Adolf Hitler and Foreign Minister Joachim Ribbentrop are busy with plans a little bit closer to Germany in the East than Japan. The Millimumul, lost off Sydney on 26 March 1941. Unfortunately, elaborate camouflage doesn't protect you against mines. British Military: The British Army is planned to increase to 59 "equivalent divisions. " This excludes colonial forces. There will be 12 armoured divisions and 9 army tank brigades. Visiting Australian Prime Minister Menzies notes in his diary that the plan is to increase the army by about 60,000 more men, which he calls a "stiff proposition." Germany, of course, already has many more panzer divisions and is rapidly increasing this number, and each panzer division is of overpowering force - when fully equipped. Reflecting the tight state of Great Britain's manpower reserves, Parliament is working on a bill that will give drafted men a chance to state a preference for the armed forces or civil defense. Of course, there are no guarantees such preferences would be honored. Conscientious Objectors will be subject to compulsory civil defense. Holocaust: The OKH authorizes the establishment by the Reich Main Security Office (German: Reichssicherheitshauptamt or RSHA) of Einsatzgruppen. These will be special squads that operate largely (but not always) independently of ordinary army (Heer) troops. The Einsatzgruppen are known to history as death squads that follow the German troops west and exterminate "undesirables" such as Jewish Russians. Yugoslavian Homefront: Large demonstrations break out in Yugoslavia, especially Belgrade. However, they are largely confined to Serbia, whose population is partial to the Allies. The minority Croats, on the other hand, sympathize with Germany. The Yugoslav military is largely Serbian and pro-England. The military also does not like the proposed demobilization of the army. All of this bodes ill for the future of the Dragiša Cvetković government. Two Serbian generals, Bora Mirkovic and Dusan Simovic, are planning a coup with British assistance. Syria: There are food riots in Damascus and Aleppo. Twelve people perish. The Vichy French authorities impose martial law. American Homefront: The New York Times prints an exposé on graft at the construction (rebuilding) of Fort George G. Meade in Maryland. Total cost overruns are estimated at over $4 million ($23 million costs billed versus an original estimate of $18.9 million). Much of the money goes for overtime. "Wild Bill" Donovan, recently returned from his extensive tour of Europe and the Middle East, delivers a national radio broadcast. He states that, in East Africa, "The British have done a superb job, a better job than they have let the world discover." Future History: Maria Grazia Lombardi is born in Frugarolo, Piedmont, Italy. She develops an early knack for driving while operating a delivery van for the family butcher shop. In 1965, Maria - who know is known by nickname "Lella" - buys a car and drives professionally. She goes on to drive in Formula Monza, then Italian Formula Three, and then the Italian Formula 850 series. In 1974, Lella Lombardi debuted in Formula One with a privately entered Brabham. After failing to qualify, in 1975 she joins Vittorio Brambilla and Hans-Joachim Stuck and races the full schedule. She finishes 7th at the German Grand Prix, her best finish. In 1977, Lella competes briefly in NASCAR in the US, finishing 31st at the Firecracker 400. She later races sports cars and retires from racing in 1988. Lella Lombardi passes away from cancer in 1992 at the age of 50. 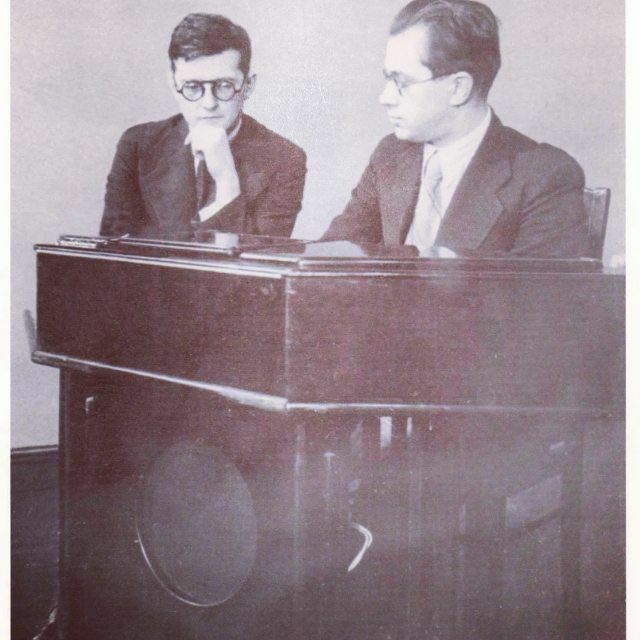 A. Ivanov acquaints Dmitri Shostakovich with the Emiriton electronic keyboard. Leningrad. 26 March 1941.